Health Food HamperWS03Smart gift box, Nakd Cocoa bar, Actisnack packet of fruit, nuts and soya, coconut flour, coconut oil, matcha green tea and quinoa rice cakes. For that health conscious family or friend that loves a food gift but without all the guilt. Delight them with this Health food hamper to keep the calories at bay. 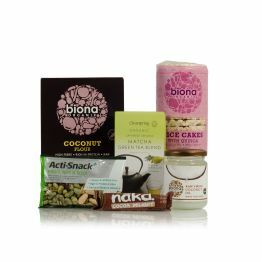 Smart gift box, Nakd Cocoa bar, Actisnack packet of fruit, nuts and soya, coconut flour, coconut oil, matcha green tea and quinoa rice cakes. 1 x Nakd Cocoa bar, Actisnack fruit, nuts/soya, coconut flour, coconut oil, green tea and quinoa rice cakes.